Washington D.C. — The Securities and Exchange Commission today announced that Deutsche Bank has agreed to settle charges that it misled clients about the performance of a core feature of its automated order router that primarily sent client orders to dark pools. The New York Attorney General’s office today announced a parallel action, and Deutsche Bank agreed to admit wrongdoing and pay $18.5 million penalties to the SEC and NYAG for a total of $37 million. “Deutsche Bank claimed to be using ongoing data analysis to rank the dark pools best suited for customer orders when in reality its system failed to actually do this analysis. When broker-dealers tout their material products and methodologies, their statements must be accurate,” said Andrew Ceresney, Director of the SEC’s Enforcement Division. But the SEC’s order finds that due to a coding error, Deutsche Bank updated the ranking model just once during a two-year period, causing at least two dark pools to receive inflated rankings and consequently millions of orders that SuperX+ would have sent elsewhere if the system was operating the way Deutsche Bank had described. The SEC’s order also finds that Deutsche Bank manually overrode the rankings on certain occasions and manually assigned fill rates for new venues based on subjective judgment that that turned out to be inconsistent with the venues’ actual performance. The SEC’s order finds that Deutsche Bank violated Section 17(a)(2) of the Securities Act and Rule 301(b)(2) of Regulation ATS. The SEC’s investigation was conducted by Marc E. Johnson, Ainsley Kerr, Mandy Sturmfelz, and Carolyn Welshhans of the Market Abuse Unit, and the case was supervised by Mr. Cohen. The SEC appreciates the assistance of the NYAG and the Financial Industry Regulatory Authority. 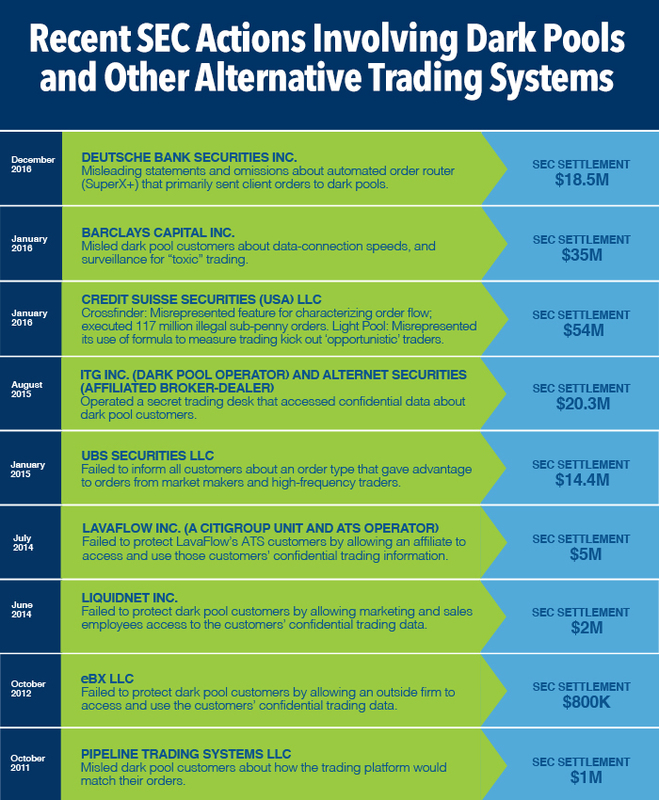 The SEC recently proposed rules to enhance order handling information available to customers from their broker-dealers, including details regarding how broker-dealers routed customer orders. The rules would require for the first time that broker-dealers disclose the handling of institutional orders to customers and expand the information included in existing retail order disclosures.